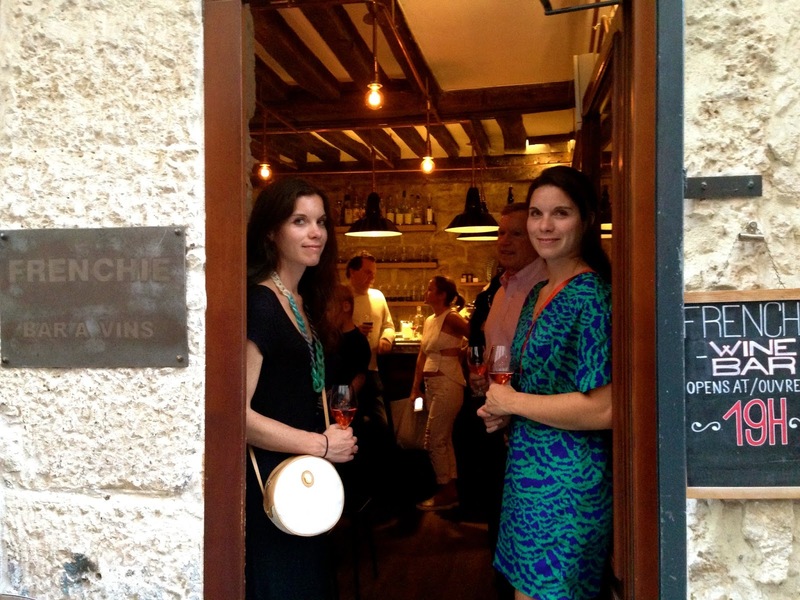 Our culinary vision in Paris was to sample classical French dishes, sip local wines, rank our favorite croissants, and also to experience the relatively new bistro movement. Gregory Marchand is already a pioneer in this new take on dining in Paris which emphasizes fresh, local ingredients and preparations that celebrate them. A trend we can relate to. His eatery Frenchie Restaurant is an adorably charming neighborhood bistro set on a cobble stoned alley in the Garment District. While the eatery is renowned internationally, it maintains its modest, relaxed atmosphere with a vibrant, fresh, focused, innovative, and ever-changing menu. Upon entry, a lovely braided-haired hostess led us to a corner table. Our incredibly charming checkered-clad server explained the menu in broken English while pouring us chilled glasses of Rosé. After we ordered, he shared some complimentary smoked pork pâté with crusty artisan bread, served on a beautifully oblong earthenware plate. To start, we shared smoked octopus, caponata, eggplant and coriander; duck foie gras, chanterelle mushrooms, apricot and fresh almonds; and confit white tuna, avocado, and cucumber. 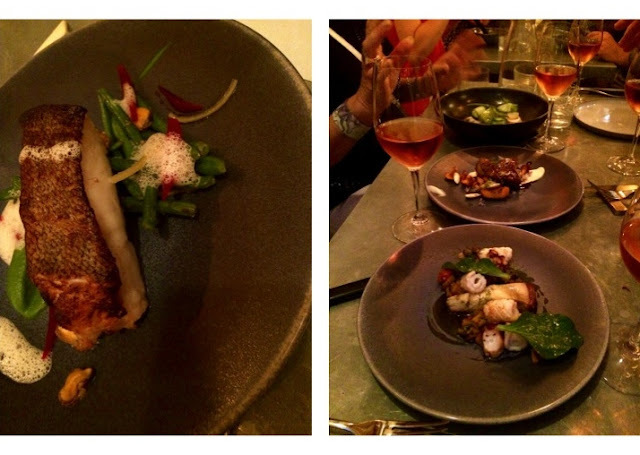 For main dishes, codfish with green beans, mussels and verbena white butter for Kara and guinea fowl with beetroots, broccoli, blackcurrant and stilton cheese for Marni. We don’t always order dessert but there was no doubt we had to here. We split a red fruit tart with exotic cream and sorrel ice cream and a Brillat-Savarin Mille-feuilles, cherry and herbal ice cream. Talk about an eye-popping overload of textures and taste! Looking back, we could not even attempt to replicate these mastered dishes but we did leave inspired to create and share. 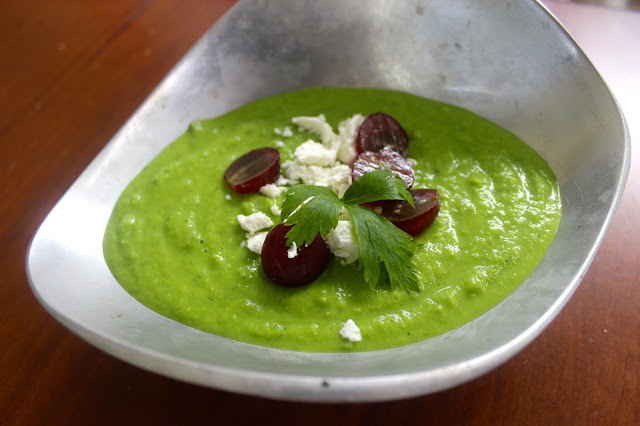 One dish that we didn't mention above was this wonderfully chilled green pea soup sprinkled with creamy goat cheese, red grapes and roasted shallots. Our take incorporates fresh mint and parsley for brightness. The stunning soup is a burst of color, with freshness from the herbs, a pop of sweetness and crunch from the grapes, and a nice soft tang from the chevre. Top with a simple drizzle of EVOO and you’re good to go. Heat a large pot over medium heat and add the butter and EVOO. Once butter is melted, add the shallot and saute for 4-5 minutes until slightly golden and translucent. Season with salt and pepper. Pour in the broth and increase to medium high to bring to a boil. Once at a boil, add the peas and cook for 4-5 minutes until tender. Turn off the heat and add the mint, parsley, salt and pepper. With a slotted spoon, remove 1/2 cup of fresh peas from the broth and set aside. Puree the soup in multiple batches or with an immersion blender. When blending, fill the blender halfway with the pea mixture (keeping an even ratio of peas/herbs to liquid) to create a smooth puree. Pour the thick, pureed liquid into a large bowl and continue with the remaining soup. Stir in the lemon juice, reserved whole peas, and season to taste. Once cooled slightly, pour the soup into a tupperware container and place in the refrigerator to chill for at least 1 hour before serving. Serves 6. To serve, pour a couple of ladles of soup into each bowl. Sprinkle with about 1 T chevre (more or less depending on your cheese taste), sprinkle about 6-8 halved grapes on top and a drizzle of EVOO. We never thought we could beat gazpacho as our go-to cold soup dish for summer, but this sure does beat the heat!